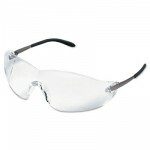 Safety glasses with single wraparound lens and Duramass¨ scratch-resistant coating. Sleek, stylish single wraparound lens has integral side shields for extra protection. Durable temples with non-slip rubber head grips for a comfortable fit. You won’t have to sacrifice style for safety with these glasses. The single wraparound lens comes with integral side shields with a sleek style and extra protection. Lenses are treated with Duramass¨ scratch-resistant coating and capable of resisting 99.9% of UV rays. Bayonet temple and nonslip rubber head grips offer a comfortable fitÑgreat for those long hours. Includes 12 pairs of safety glasses.